This week I did my 400M and 800M intervals on Tuesday evening. I am sticking very strictly to 1:36 for 400M and 3:12 for 800M, I can pace it fairly well now, usually arriving under a second within the 400M time. The 800M however is causing me a problem. I am running, in the dark, with a head torch, on a uneven trail. It used to be a railway line, but is now just a dirt track, and gains 50ft of height. So I have to run two of the 800M splits uphill and 2 downhill. It's dark, and not easy to see even with the head torch as I am running around 9.5mph over that distance, and a little treacherous underfoot. Anyway, the net result is that I am missing the uphill 800M split by 5 seconds. I was always hitting it no problem in the summer, so the dark and mud are obviously slowing me down. There isn't a lot I can do about it, just accept it. I know it would comfortable on a track, which is where I should be doing these I guess. I went to the Yoga class at the gym later on in the evening. On Wednesday I did a 6 mile road run; quite a lumpy one with around 700ft of ascent. I used my road shoes for the first time in a few months. It was actually because both pairs of my identical trail shoes were still soaked through and caked in mud, which made the decision on the road route. I woke on Thursday with a very slight cold, but an elevated resting heart rate, so I decided not to run the speed session that evening. I did go and do my usual gym work in the evening though. Friday, I had recovered, but I am currently using as a rest day anyway. I will add in a run after Christmas. On Saturday I didn't plan a set route, but just took a guess wanting to do around 12 miles. When I got back and measured it, it turned out to be 11 miles but there was 1200ft of ascent; all on trails or across fields. Saturday is just an easy pace steady run; very enjoyable. I tend to run around 9 minute miles or a little less I think, but I don't take a watch as I don't time these runs. As soon as you take a watch, you start racing yourself and my Saturday run isn't about that. The speed comes from the Tuesday and Thursday runs. The route and hill profile is shown below. Click to enlarge. Just as something different I took photo's on my training run, to give you an idea of the terrain I run in all the time. I always head straight uphill from my house on the road for 1 mile to reach the fields. 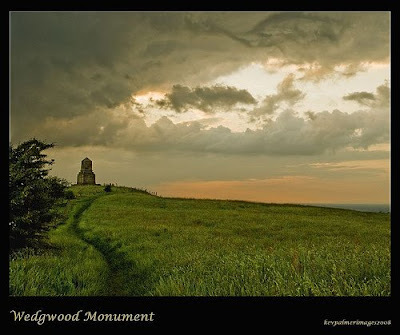 I cross a stile and head up to a local monument; the Wedgwood Monument shown below (about 1.5 miles to this point). I've pinched a link from someone else’s website for this one, because it is a nicer shot, and shows the path I run up. Once at the needle I continued down the hill over fields, then farm track. I then pick up the road into the village of Audley (at 3 miles) before joining a mile and half long abandoned railway trail as shown below. A short couple of hundred metres of road leads me into a local nature reserve; actually the site of a former mining colliery (Minnie Pit). I run through the nature reserve for a further mile, before then heading up this field and through the woods on a narrow path to a small number of houses in the area Scott Hay. There is then a mile long section on road to take me into Silverdale and into a footpath through the mining colliery that used to be there. There is a steady climb up to black bank. Then views over the local area and into Apedale. I head into Apedale (yes you've guessed it, another former mining colliery! ), which has now been turned into another nature reserve, with well maintained paths that rollercoaster steadily up and down. I train here a couple of times a week. I run through there and join yet another abandoned railway line for half a mile before heading down to another small lake. I then emerge into fields and have about a mile and half to get home, all steady uphill as shown here. The last half mile is on the road and I'm home! Onto Atacama information: I emailed a former competitor and he said that hiking poles were an absolute must. He said that they were invaluable on the razor sharp salt flats where your feet frequently break through into the slushy salt goo underneath, and you can easily lose a shoe! He also said they were really useful for finding your way across the daily and many river crossings. He said there is point wearing waterproof shoes or socks because you can be up to your waist in river water at times. So, I am definitely going to have to get reacquainted with my Leki poles again. I'd viewed them as a bit of a soft-option to be honest, and didn't need them anymore, but after hearing this advice from a ultra fit (he won the KAEM last year) American Police Sergeant and former Marine, I am taking my poles! An ultra running acquaintance of mine has also entered and we are heading out to Chile at the same time. You can read about his former races, which pale my few small achievements into insignificance here. Mark has done 'DOUBLE Badwater'!! Spartathlon (3 times), and the UTMB just to name a few. Check out his running CV and race reports. If I can do half of what he has achieved I'd be happy! That's it for this week, have a good one.